The most important part of any content marketing project is the planning and strategy stage. Here are the core services that make up our content marketing strategy work. Once we have worked with you to determine an appropriate content marketing strategy, we are also here help you act on your plan with our content marketing services. We’ll help you sort your customers — and, as importantly, your potential customers — into targetable groups, or “audiences”; clarify how they make purchasing decisions; and discover where they spend time online. We’ll research your key customers and explore with you what you know about them. Then we’ll help develop detailed customer profiles, focused on needs and goals and described in actionable terms. These “personas” will help you understand your customers more clearly, and will guide us as we develop content that not only appeals to them, but helps them solve problems they face. We’ll survey your online content, whether it’s currently active or not, and evaluate its potential value. Reuse and recycle! This isn’t just a slogan — you’ll save valuable resources. We’ll review your website’s structure and scrutinize its nuts and bolts, including platform technology, navigation, page composition, visual appeal, usability, and responsiveness. We’ll evaluate how your online presentation compares with that of your key competitors. What content and functionality do your competitors offer that you don’t? Where can you achieve advantages? We’ll assess your current content for readability, scanability, conciseness, objectivity, effectiveness, and more, and we’ll recommend cost-effective improvements. 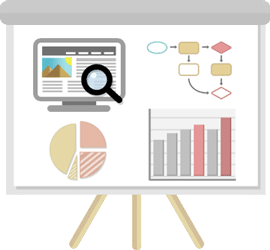 We’ll evaluate and massage the measurement tools you have in place, provide others you may be missing, and configure them all to better monitor your content marketing effectiveness. We’ll review the way your company creates, edits, and publishes web content, and we’ll help streamline the process and make it more productive. We’ll get to know your company — its personnel, structure, policies, resources, and commitment — to help ensure your readiness to begin and sustain a successful content marketing effort. We’ll build a flexible, detailed — and unique to your needs — calendar tool to help plan, integrate, and track your online channels, recording the work to be done, who will do it, and how it serves your overall strategy. Your calendar will be an essential component to keeping your company’s content marketing efforts on track. For more information about the services we offer to implement your content strategy, please click here.